I was invited to the private view of paintings by John Salt at the Ikon in Birmingham. John Salt was the first artist to show at the Ikon and then he had a major show in 1975 curated by my then boss Simon Chapman with many of the paintings lent by Ivan Karp of the OK Harris gallery, New York. Originally from the Sheldon district of Birmingham UK, at the age of 15, John gained a place at Birmingham School of Art where he studied from 1952 – 1958. From 1958 to 1960 he studied at the Slade School of Art in London. Early influences were the works of Prunella Clough and American pop artists such as Robert Rauschenberg. After teaching for a spell at Stourbridge College of Art in the West Midlands he decided in 1966 to move to the United States and was eventually offered a place in 1967 at the Maryland Institute College of Art in Baltimore. In Baltimore Salt noticed the work of photographers Garry Winogrand and Lee Friedlander and how the photographers’ documentary style relieved them of the need of any self-consciousness in terms of artistic technique. Salt was to start painting from closely zoomed photographs of car interiors. The paintings were at the time still painterly interpretative representations of the photographs. He was later to attempt to remove traces of interpretation by following the photographs ever more closely. One painting of this more faithfully detailed style was taken directly from a Buick catalogue. Salt was planning to return to England at the end of his Baltimore engagement in 1969 but when a New York dealer bought two of his works he decided to to move to that city. His work in New York moved away from consumerist portrayals of car interiors to work that was based on his own photos. After his discovery of a scrapyard under Brooklyn Bridge the images began to be of more mangled or wrecked cars. It was in New York that Salt developed a relationship with dealer Ivan Karp who was on the point of opening his own gallery and who had a portfolio of artists associated with the then emerging Photorealist movement. Salt’s first one man exhibition was in New York in 1969. He was then to feature in 1972 in the prestigious Documenta 5 exhibition in Kassel, West Germany, where the American Photorealist movement first gained an international reputation. Through the early seventies his work became even more detailed and realistic realistic painstakingly using an airbrush with stencil to obtain the photo-like precision he sought. His characteristic iconography was of photos of trashy trailers and beaten up cars taken in poor semi-rural areas. As well as the astonishing realism there is a poignancy to these pictures and possibly the slight feeling of voyeurism in the way they go to depicting poverty. Perhaps there is something harking back to the rural works of the English 18th Century. Perhaps we will see these works on the chocolate boxes of the next century (hopefully not). 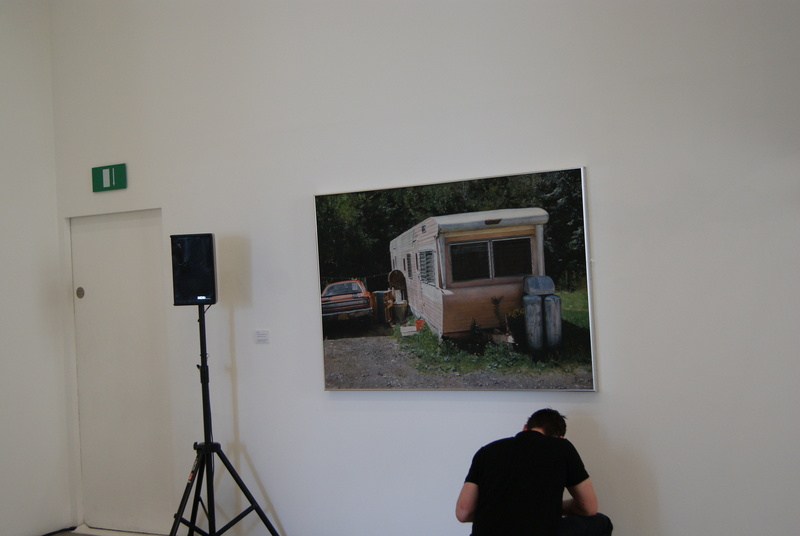 The above is an installation shot of Pink Trailer with Plymouth 1977 at the Ikon’s This Could Happen to You exhibition last year. For more images go to www.ikon-gallery.co.uk where you can view a pdf file. This entry was posted in Ikon. Bookmark the permalink.